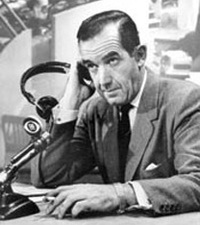 Edward R. "Ed" Murrow was an American journalist and television and radio figure. He first came to prominence with a series of radio news broadcasts during World War II, which were followed by millions of listeners in the United States and Canada. Mainstream historians consider him among journalism's greatest figures; Murrow hired a top-flight cadre of war correspondents and was noted for honesty and integrity in delivering the news. A pioneer of television news broadcasting, Murrow produced a series of TV news reports that helped lead to the censure of Senator Joseph McCarthy. The Roots of the Trouble and The Black Record - Past, Present and Future?